Lennox Lewis-Shannon Briggs was a heavyweight rumble to remember! One year short of two full decades ago today, WBC heavyweight king Lennox Lewis met lineal ruler Shannon Briggs in Atlantic City, New Jersey, and a surprisingly fun fight took place. The two men with a big punch and a big personality, Briggs especially when it comes to the latter, slugged it out for five thrilling rounds. Briggs, who was coming off a highly contentious decision win over living legend George Foreman – the 12 round majority verdict seeing Briggs become the lineal champ – had his moments early on, both rocking and shocking a slightly overweight Lewis. But Lennox showed his experience and took over in the 3rd round, catching the New Yorker with shots that opened a cut in Briggs’ mouth. Briggs remained dangerous as well as courageous, but Lewis decked him heavily in the 4th, and then twice more in the fifth round, finally getting the TKO win. A poor man’s Foreman-Lyle, the March 1998 rumble looks a whole lot better today, as bereft as we are of quality heavyweight championship fight violence the type the two fast-handed big men gave us 19 years ago. Indeed, all these years later, it’s quite amazing to think Lewis’ critics, of which there were many, referred to the British/Canadian king as a boring or dull, safety-first fighter. Look at Lewis’ classic fights/performances against the likes of Briggs, Andrew Golota, Mike Tyson, Ray Mercer and Vitali Klitschko and it’s clear: Lewis was in no way a boring heavyweight. 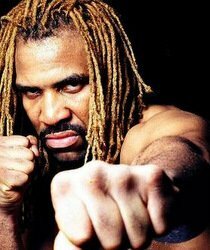 Also truly amazing is the fact that, all these years on from suffering just the second stoppage loss of his long (very long) pro career, Briggs is still here fighting today; even on the verge of a WBA title fight of some kind, against Fres Oquendo, set for this coming June. Lewis is of course long retired, his place in history as secure as can be. Briggs, at the advanced age of 45, is still chasing history. It’s a shame the Briggs of the Lewis slugfest is not around today. That fighter would be capable of giving the likes of Deontay Wilder and Anthony Joshua a real fight. You are here: Home / Boxing History / Lennox Lewis-Shannon Briggs was a heavyweight rumble to remember!